The VOS Barn is all a tizzy with activity over the past days and weeks! It’s been a busy week at the VOS THEATRE barn in Cobourg. The Spamalot costumes are being prepped by Lannette Donnelly and Liz Clark for an upcoming rental at Trinity College School. Tuesday and Wednesday was spent going through the inventory and examining it for repairs and “stink”. The Spamalot sets and props will return Sunday evening from a 3 week stint in Mississauga, where they will be safely stowed until April for the TCS production in April. Meanwhile, waiting to take over with a monster set build are the Young Frankenstein construction crew, pictured below, raising the roof. The team has been working multiple nights per week, fuelled by coffee, donuts, and driven by crew chief Scott Berry. To say we appreciate their time and talent is an understatement. Keep up to date with the VOS Blog as we roll our production of Young Frankenstein towards our April 14th Opening Night! Valentine’s Day is just days away so get your lovely Monster a real treat – tickets for date night in Transylvania! Sir Not Appearing in this Show is a Woman! 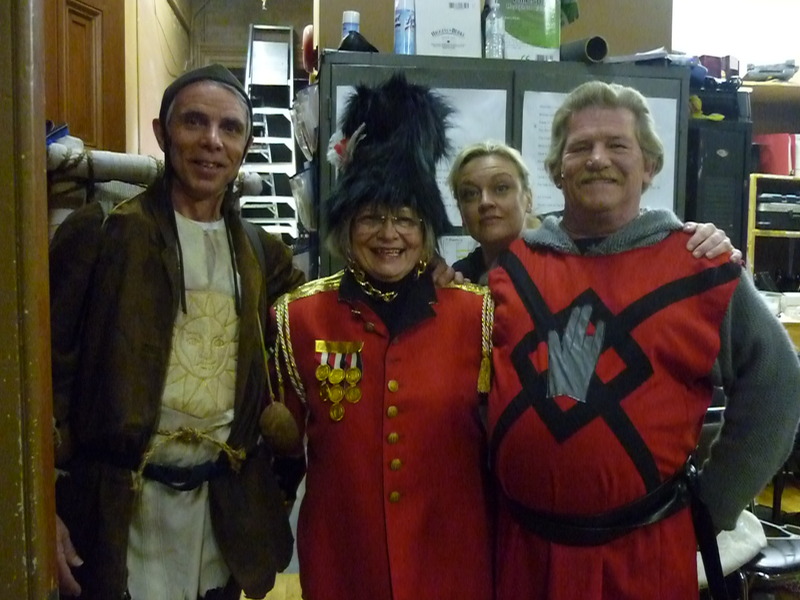 The VOS production of Spamalot included a great team of people backstage as well as onstage. Here David Bryson, Bea Quarrie, Liz Clark and Doug Littleford pose for a moment frozen in time. Bea, who was dressed in costume to not appear in the show, will be hosting a play reading series for VOS this year. David and Liz Clark will be working closely together on the upcoming production of White Christmas.